Ashland native Catherine O’Clair has lived in various cities and towns throughout Maine and New England, but what threads all those places together are the paintings she has used to capture the unique scenery around her. 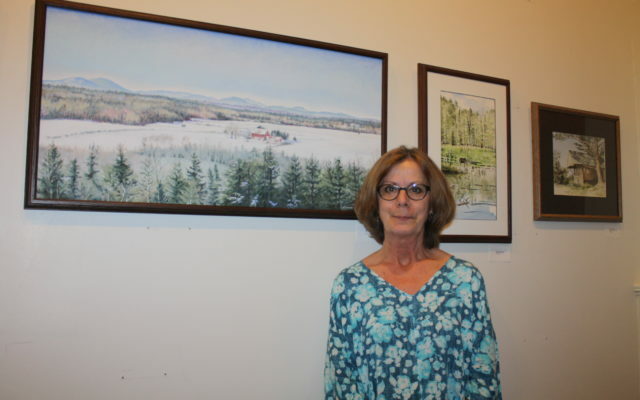 PRESQUE ISLE, Maine — Ashland native Catherine O’Clair has lived in various cities and towns throughout Maine and New England, but what threads all those places together are the paintings she has used to capture the unique scenery around her. “I’ve always painted the landscapes of wherever I was living at the time,” said O’Clair, who returned to her hometown six years ago. O’Clair is the featured artist of the month at Wintergreen Arts Center in Presque Isle. She debuted her exhibit during the latest First Friday Downtown Art Walk on Feb. 1. O’Clair had been drawing all her life, but it was not until she was living in the greater Boston area and working for a computer company that she began pursuing art. She took evening classes in graphic design, color and production techniques at the Massachusetts College of Art and Design, and later taught herself to paint with watercolors and oils. While living in the coastal village of Sorrento, Maine, near Bar Harbor, O’Clair owned an art gallery in which she shared her paintings of Frenchmen Bay and the surrounding ocean landscape. She later lived in Belfast while employed at Bank of America and often depicted the city’s downtown region. At Wintergreen O’Clair showcases several Belfast watercolor paintings including “Guardian Angels,” which portrays angel statues at an area cemetery, and “The Gothic,” that captures a church on Main Street in Belfast. Six years ago, O’Clair returned to Ashland after marrying Fred Howes, who had been her high school sweetheart. “When we met again it turned out that both of us were had been divorced. We started dating again,” O’Clair said. Much of O’Clair’s Wintergreen exhibit features landscape of Ashland and surrounding areas, such as the Tilley Farm in Garfield Plantation and a view of the Presque Isle Road as it enters Ashland. She also depicts moose and deer in their natural wooded settings. O’Clair noted that moving back to Ashland after being away for years made her notice the intricate details of the landscape more, which has influenced how she paints. Heather Bessey of Ashland is a friend of O’Clair, and said she values how much her paintings depict both the scenery and atmosphere of the Ashland region. Some of her favorite paintings are those that show winter scenes. Community members can view O’Clair’s exhibit throughout the month of February at Wintergreen Arts Center, located at 149 State St. in Presque Isle. The next First Friday Downtown Art Walk will take place March 1.